Twitter critics have a message for the more than 150 Evangelical leaders behind a document called “The Nashville Statement”: Please hold off on your gay bashing until after Hurricane Harvey. Or, you know: Knock it off altogether. 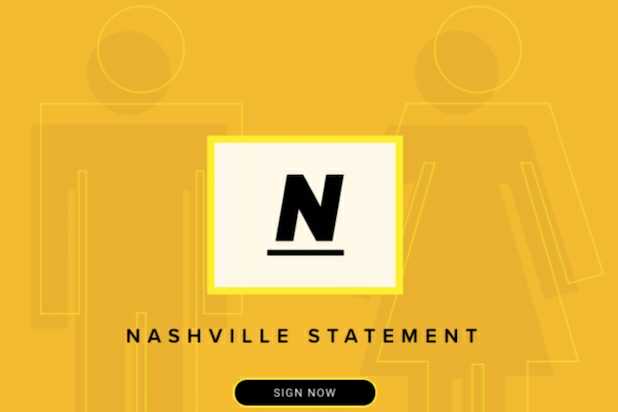 The “Nashville Statement” emerged from a meeting of the Southern Baptist Convention’s Ethics and Religious Liberty Commission’s annual conference in Nashville. It consists of 14 statements of affirmation and denial relating to human sexuality. “It is sinful to approve of homosexual immorality or transgenderism,” said the statement, issued in the year of our Lord 2017. “WE AFFIRM that self-conception as male or female should be defined by God’s holy purposes in creation and redemption as revealed in Scripture,” read one affirmation. “WE DENY that adopting a homosexual or transgender self-conception is consistent with God’s holy purposes in creation and redemption,” read another. “I have other thoughts on the #NashvilleStatement, but my first was, ‘Don’t they know we’re still trying to rescue people from Harvey? '” asked another. Hurricane Harvey, which has since been downgraded to a tropical storm, has ravaged Houston, flooding roadways and forcing an estimated 30,000 people out of their homes. See more Twitter reactions to the Nashville Statement below. Joel Osteen: No way anyone can top how tone deaf and Biblically blind I've been during #Harvey #NashvilleStatement: hold my BEER! ???????? The pastors who created the #NashvilleStatement could be helping victims of #Harvey right now. But they chose to attack the LGBT+ community. The #NashvilleStatement sounds like @CBMWorg planned for a post-gov't world, in the off-chance Hurricane Harvey was actually God's wrath. Also Read: Is Trump Using His Public Office to Sell Hats? I have other thoughts on the #NashvilleStatement, but my first was, "Don't they know we're still trying to rescue people from Harvey?"